Lost your keys AGAIN? If you are one who can not keep track of your keys, this DIY tutorial is for YOU! 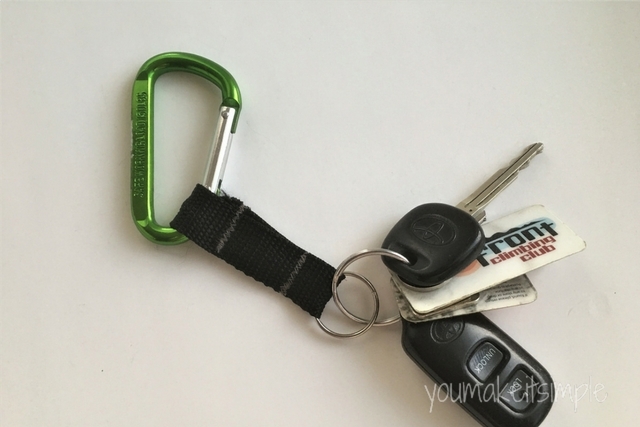 I am going to show you how easy it is to make a carabiner key chain. It really is a snap! Seriously, why is it so hard to find your dang keys? You know the drill. You get to the car and the fumbling begins. Reaching your hand in the endless pit of STUFF in your purse, there are no keys to be found. You try one pocket, then another, not there. Oh the FRUSTRATION!. Now you are all worked up and stressed. Well it doesn’t have to be that way! I have found something that WORKS! My husband has been using a carabiner keychain for a long time and he always knows where his keys are. So I decided to make my own. I know it’s not the most feminine thing, but the purses I enjoy are a little playful and whimsy anyway, so it works for me. In fact it has been working quite well. I LOVE IT! Right when I get out of the car, I simply clip my keys to the side loop of my purse and let the keys fall inside. When I am ready to get in the car, I EASILY unclip the carabiner and viola, keys in hand I am ready to roll. Works like a charm. Are you ready to simply your life a little. I am telling you, this is a game changer. I like to buy a variety of sizes like is in this set. They do come in handy for other things. You can find them at most stores, often at the checkout isle. You can get these at Home Depot, Amazon, or other hardware stores. This one from Amazon, comes with the split keyring. I am a recycler! This is my box of random webbing pieces that I have salvaged from different things that I no longer want or use. (bags, backpacks, coats, etc.) I save the hardware as well. They really do come in handy for a lot of things. So if you don’t have a stash yet of random webbing, something you may want to consider. (Keep it to a minimum, remember) I don’t want to promote a hoarding scenario here. 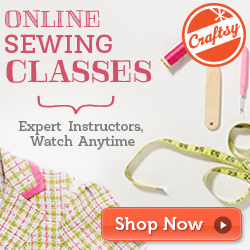 You can use a zigzag stitch or two straight stitches. It should measure 2 1/2 “. Using a zigzag or straight stitch, to secure the top folded webbing in place. Add your keys and you are ready to ROLL! This is how my husband hooks his keys to his backpack. They can also be attached to a belt buckle. If you have any questions while sewing these up, shoot me a note. Get ready for hassle free key accessibility!